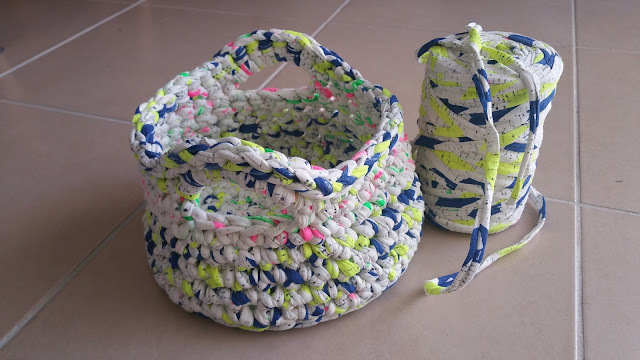 I know that I *just* did a class on making crochet baskets but I didn't feel that I got everything out of it that I needed to make awesome baskets. 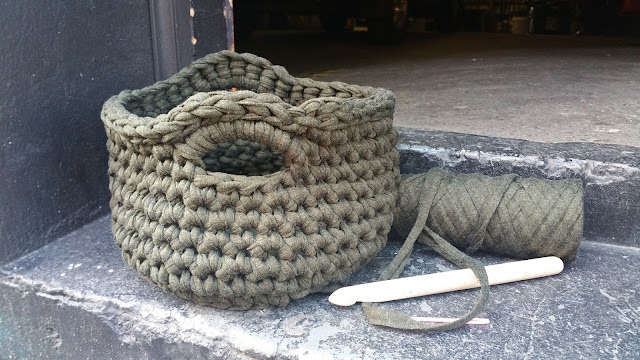 I did hesitate quite a bit about booking another same-same class but I'm glad I took this one at Workshop in Redfern on Saturday as I walked about with some new skills to make more professional looking baskets...and a new obsession! 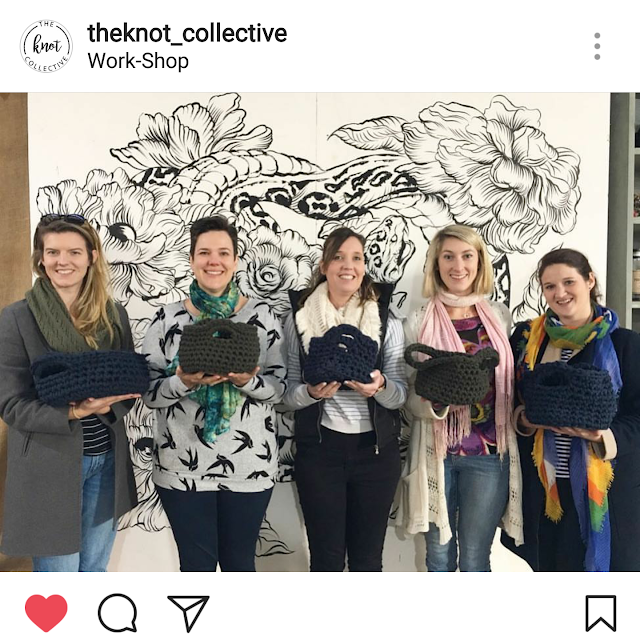 The class is taught by Amy from The Knot Collective - she was a great teacher and very patient. We got to choose what size basket to make (small, medium or large) and I think nearly everyone in the class went with the medium size. 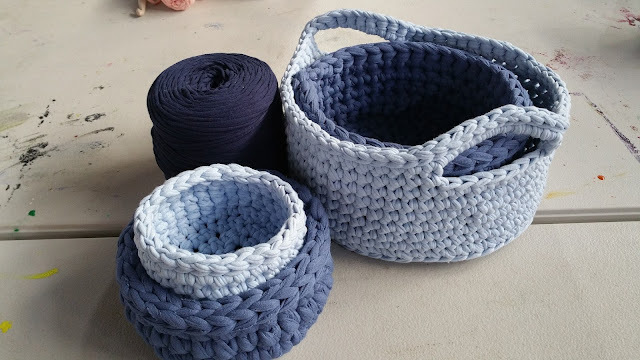 I really love the handles on the baskets she brought as examples so we got to make those as well - they are so much more simple than I had thought! The class went for four hours and I remember thinking when I booked it that that is a VERY long time. It's not! We all finished our baskets but worked right up until the last minute. The yarn (t-shirt yarn) was very thick and the hook was a mammoth size 15 -- so it was slow going as the hands get very tired. 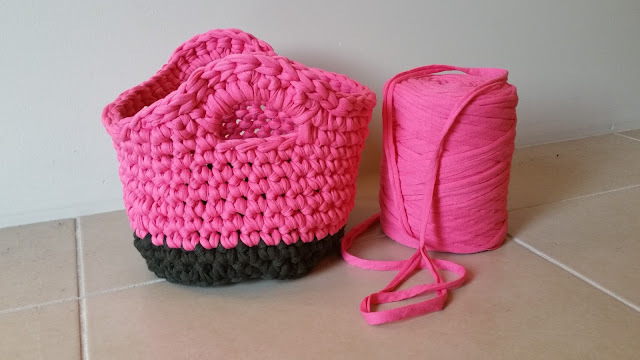 Below is my finished basket - I LOVE it! I love the handles and I love that we learned how to turn the work so there is a distinct base and walls. 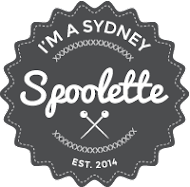 I think it looks pretty professional and am totally going to give up my day job now to open an ETSY store selling baskets. I wish! Here we all our with our finished baskets....I love how they are all same same but different. As soon as I got home I whipped out the Spaghetti Yarn I bought from Lincraft after my last class and got stuck right into making another basket. I wanted to practice the "magic circle" technique used to start the basket as well as turning from the base up to the walls. Needless to say I LOVE THIS BASKET! 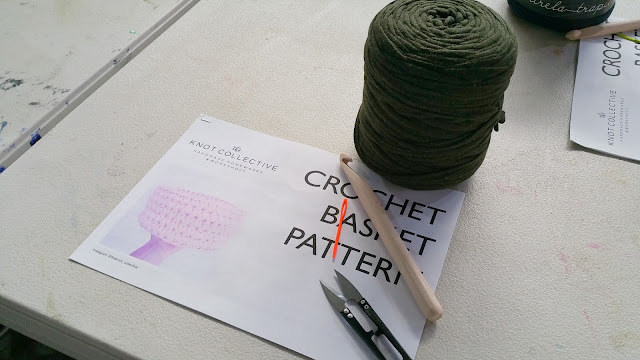 We were also shown in class how to change colours so I wanted to practice that too - it's something that will come in handy with the rest of my crochet (to date I've just been tying a knot in my yarn and continuing on...naughty). I LOVE the way this one looks - the pink is fantastic. I'm giving this one to a friend as a gift as I don't think I need a house filled with these - though it would be nice. I have some of the pink and colourful white yarn left over and I'm going to have a go at crochet a rug/bathmat from it. And a friend at work is keen for a basket...so yay to more crocheting!